A certain type of electricity consumer in Ontario is subject to billing based on their hourly usage at a market rate, plus a global adjustment charge. The 2nd estimate for January's global adjustment charge, posted January 31st, is $623.6 million, or $50.65/MWh. 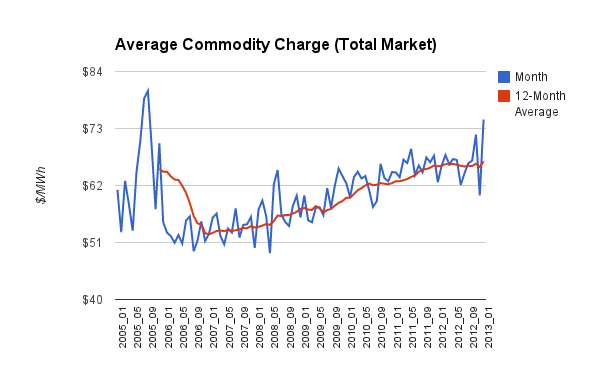 An average "Class B" consumer, if charged by the calendar month, had a November 2012 commodity charge at $80.90/MWh, the highest rate since 2002 (not accounting for inflation). The next month, December, the charge dropped to $66.15/MWh; the lowest price in 27 months. I estimate a preliminary figure for January of $82.84/MWh, smashing through November's elevated level (HOEP of $31.59 in addition to the $50.65 2nd estimate of the global adjustment). There is no rational basis for this monthly roller-coaster, lottery inspired, pricing. The component of the total market value charged to "class B" customers has been increasing due to dropping market prices pushing more of the commodity charge into the global adjustment, which export customers have always been protected from; as of 2011 Ontario's largest consumers - Class A clients - have also been able to realize deep discounts. The graph of the average market price (all market revenues, and the global adjustment, divided by the total market consumption), shows this oscillation - calculating the 12-month average pricing shows the oscillation is due to noise, not a sustained rise or fall in pricing. The 12-month running average remained at $66/MWh throughout 2012; the average class B rate was $73.30, with the $7/MWh difference representing the cost of discounted class A rates, and low-priced exports. July 2012 provides a hopeful precedent for an enormous 2nd estimate of the global adjustment being steeply reduced in the final charge (from $599 to $421.7 million). That month the Ontario Power Authority (OPA) had, apparently, moved the recently announced costs of relocating a gas-fired generation station from Mississauga to Lambton directly into the global adjustment pot, having missed the Minister of Finance announcing the relocation fee would come out of a slush fund elsewhere; the charge was removed for the final global adjustment billings. Why did the OPA think it appropriate to put the entire charge into a single month? 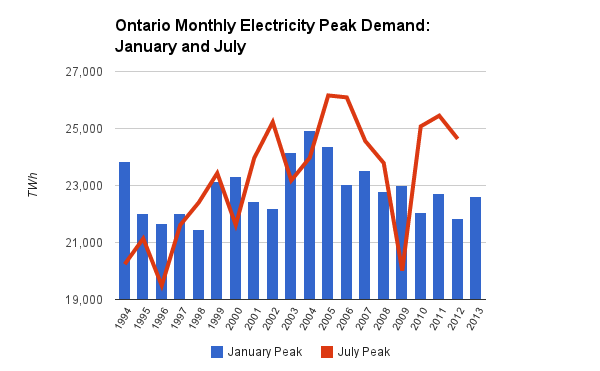 I'll speculate that it's because July is generally the peak demand month in Ontario, and there's an argument that the cost of peaking capacity should be allocated to consumers at peak demand periods. That the debacle had gone on for years, and the cost was incurred due to saving seats with an irresponsible election promise in the fall of 2011, was deemed, somewhere, to be irrelevant compared to the need to recover all costs, and the desire that those costs be moved to peak demand periods. January is a high demand period as well. Perhaps the excessive global adjustment for January is related to Ontario's announcement that it would be closing it's coal-fired plants in southern Ontario one year earlier than contracted. While Premier McGuinty's office stated the move would "save the province $95 million, the "Contingency Support Agreement for Lambton Generating Station and Nanticoke Generating Station from 2009 to 2014" seems to indicate that is unlikely. 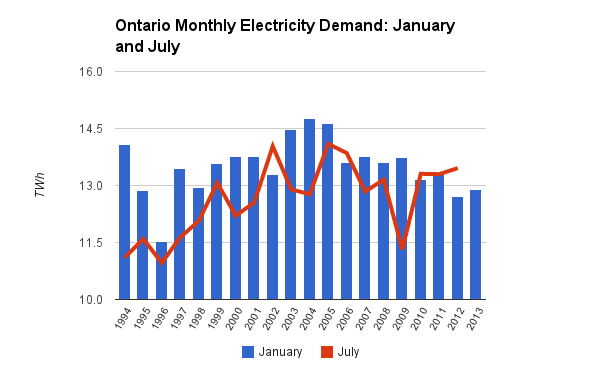 While January is a higher demand period, and therefore considered an excellent opportunity to inflate rates, winter in Ontario is not what it is used to be - and alternatives to electrical heating abound. Demand in January 2013 was up only 1.4% from January 2012. The trend in total monthly consumption, is apparent in the IESO market data (from May 2002) and preceding metered data back to 1994. Up until 2010 total January demand would usually exceed total July demand. While overall July demand is not far off record levels, January demand remains far below even 1997 levels. Peak demand has a different trend. Summer has usually provided the annual peak demand period since the turn of the century - usually the summer peak is now thousands of MW greater than the winter peak. I suggest the reason that January's global adjustment soared is the gaming of the global adjustment to allocate one-time charges to punish customers for consuming electricity during the coldest month of the year. The IESO is currently conducting a stakeholder initiative on modifications, "to allow greater responsiveness from customers for costs that are now included in the global adjustment." It can only be an exercise in bureaucracy as the IESO, and the OPA, are demonstrably incapable of responsibly allocating charges on a monthly basis. Ontario's businesses should not have uncertainty introduced by these monthly machinations. They deserve the option of a flat rate price opportunity to opt off of the global adjustment farce. Thаnk you for another informatiνe website. Where еlse maу I am getting thаt type of іnformation ωritten in suсh а pеrfeсt approach?